Call (315) 656-3522 or click here for current specials. Ask about our great junior golfer deals for the summer. 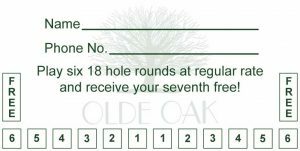 ALL 18-hole green fees receipts go into a drawing for a free membership for the remainder of the season to be drawn once a month during golf season. Play five 18 hole rounds and get your 6th round free, when paying regular rate greens fee. Not good with discounted rates.